I still haven’t played all the games I wanted to from 2012, seriously I have yet to play both Rex and Merchants of Venus, never mind all the games I wanted to play from 2013 and 2014. Yet the gaming industry doesn’t stop and due to the backlog of funded games on Kickstarter and the way in which the industry as a whole is getting better at building hype for future games, we have a really good idea of what’s available in the coming year. So much so I was able to put together a list of 20 games that could possibly be brilliant in coming year. If even half of these games deliver on their promises then 2015 is going to be another awesome year in gaming. My most anticipated miniatures game, and probably my most anticipated game overall of the year is Star Wars Armada, the game that promises to do for fleet based combat what X-Wing did for dog fighting. We’ve already seen the models and they look just as stunning as those for X-Wing and we’ve also been given a lot of information about the rules and play style. Instead of fast and reactive combat, Star Wars Armada makes players think several moves in advance, quite literally, as you have to program several turns’ worth of actions and manoeuvres onto your large ships ahead of time. This should lead to a slower, but much more strategic game of careful positioning. My only concern with the game is the price point. The starter set is fairly reasonable for a miniatures game, but is still asking much more than X-Wing did and the price of extra ships is looking to be in the region of the larger X-Wing models. You could argue that Star Wars Armada isn’t your traditional miniatures game and there are those who scoff at the thought of pre-painted miniatures, but they need not worry as there are plenty of new more traditional games on the horizon. The one game that stands out for me however is Guild Ball. When you first describe Guild Ball it sounds like a Blood Bowl derivative; fantasy teams playing football. But this isn’t American style football, nor is it the Football Association’s version of football, no this is the oldest version there is, where tens of players would form two teams and kick an inflated pigs bladder from one end of the village to the other. It’s such a unique twist that it really stand out to me. It will be played on your typical tape measure style green flocked tabletop but will involve a variety of guild based teams kicking and scrapping across the table. The developers have also put a lot of thought into the teams as each one represents an artisans’ guild; there’s butchers and fishermen, alchemists and engineers, each with their own unique twist. I’m saying it now 2015 is going to be the year of the hybrid game, and if you’re not sure what a hybrid game is don’t worry, because I’ve only just made the term up. To me a hybrid game is one that bridges the gap between miniatures game and board game. It’s tactical, it’s got amazing quality miniatures and has some form of personalisation, such as squad building or experience, but is played over a board. 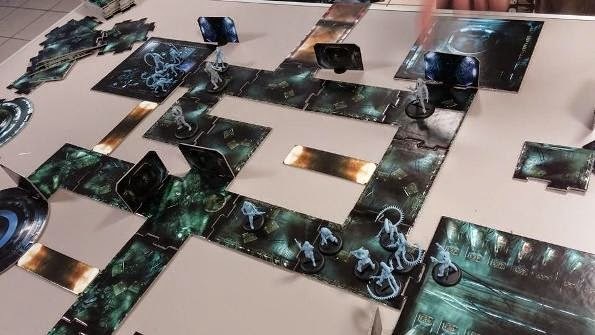 It’s not a new concept, you can go back as far as Heroquest right up to Imperial Assault, but it does seem to be getting more and more traction, especially with the success of Kickstarter. Speaking of Kickstarter, many of these games are on this list because they successfully reached their goals on the popular crowd funding site and should be making their ways to eager backers in 2015. One of the most anticipated of which is Aliens vs. Predator: The Hunt Begins. 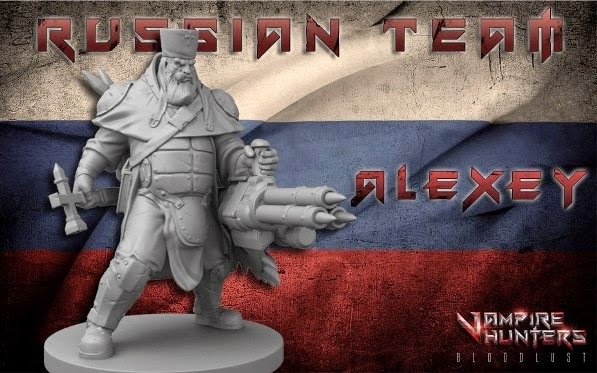 This has to be the perfect example of my Hybrid game concept; a tactical miniatures based board game that also doubles as a traditional tape measure based miniatures game. 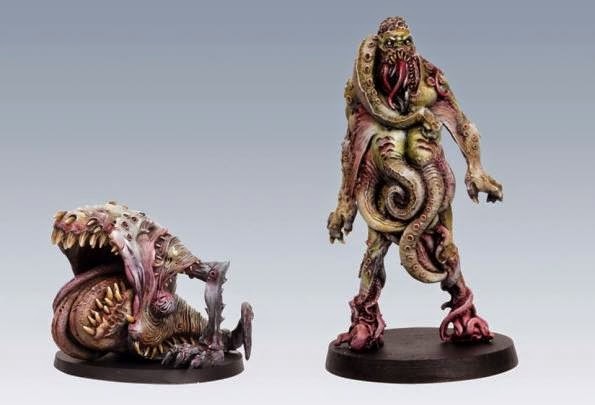 We’ve seen some of the sculpts of the aliens and predators and I’m pretty sure most people would be happy enough if this game only played out like a rebranded Space Hulk but Prodos Games are promising so much more. There have been a few delays which rumours are attributing to some tricky licence signoffs from Fox but the game should be with players soon. Eric Lang, who is quickly turning into my favourite game designer, is teaming up with Guillotine Games and Studio McVey for a double whammy of games in the form of The Others: 7 Sins and Bloodrage. Bloodrage is actually looking more like a traditional board game, where players act as Viking Clans released from Valhalla to fight off trolls and other monsters from Norse mythology. The concept artwork released has all come from the easel of Adrian Smith so everything looks nice and grimy and scary. How the game will play out is still fairly under wraps but the player boards suggest managing long ships and gaining rewards from defeating mighty monsters. Rumours are we’d be seeing a Kickstarter of the game in February, so there’s not long to wait. The Others: 7 Sins follows a highly specialised government taskforce as they save the world from demons invading from another dimension. 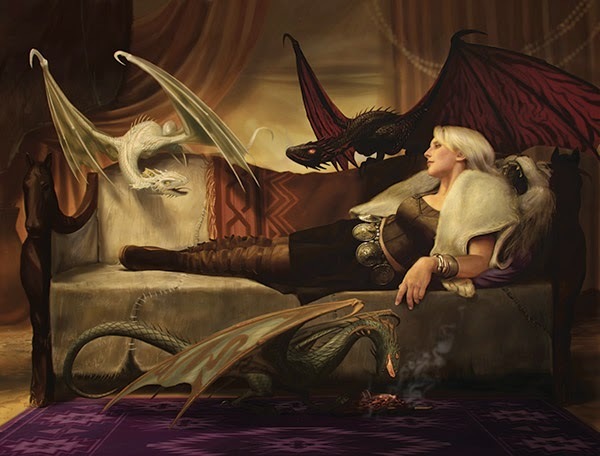 Again the artwork looks amazing but we have has zero information to date on how the game plays. There’s even less details about this game than Bloodrage but the concept sounds cool and I have faith in Mr Lang. Probably hitting Kickstarter soon is Vampire Hunters: Bloodlust (previously VHunters) a dungeon crawler game where a team of tooled up monster hunters breaks into a nest of vampires to generally kick arse. 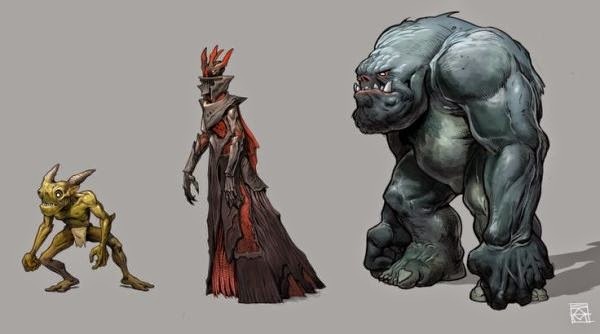 The concept alone sounds cool, but new company DG Games have cranked things up a notch with some seriously crazy character designs for the titular vampire hunters. We’ve got holy water cannons, robotic crossbow arms and a crazy Russian carrying a belt fed stake firing minigun! The game is also promising some cool mechanics such as smashing windows to let sunlight into the vampire’s nest. Currently on Kickstarter, and doing very well for itself, is Conan: Hyborian Quests. 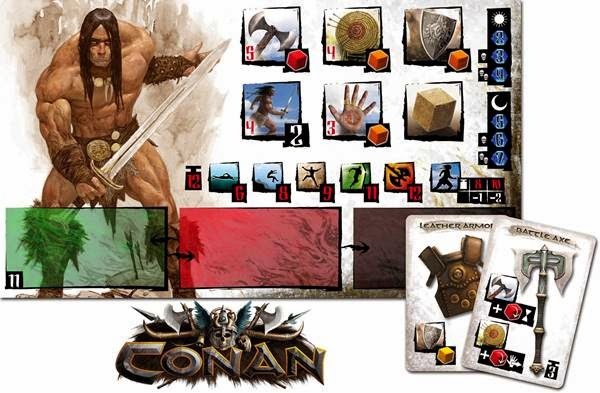 At first Conan may seem like a very typical hybrid game, grab a party of low fantasy heroes and wade into a scenario full of pirates or picts. What makes Conan unique isn’t just its theme but the use of an almost euro game style mechanics for managing your character’s actions. I’m already thinking that I’m not going to be a fan of The Magic the Gathering the Strategy Board Game. It may seem weird in including this game on a list of games I’m looking forward to but this is mainly from a curiosity point of view. I’m still not convinced that the game will be compelling enough, especially after the apparent failure of Dungeon Command, a 2012 game from Wizards of the Coast that has a very similar feel, but the proof of the game is in the playing and I am willing to be proven wrong. Perhaps that game that has been the longest coming on this list is Burning Suns. The game met its funding goal on Kickstarter in 2013 and the current schedule suggests that backers won’t get their hands on the game until October 2015 but that just means the anticipation is growing further. It’s an extremely ambitious project; a customisable space empire building 4X game that promises the possibility of 700 different alien empires to play. With so much in the game there’s a risk that it’s going to be a complicated beast but early previews suggest that the game is much simpler and streamlined than it first appears. 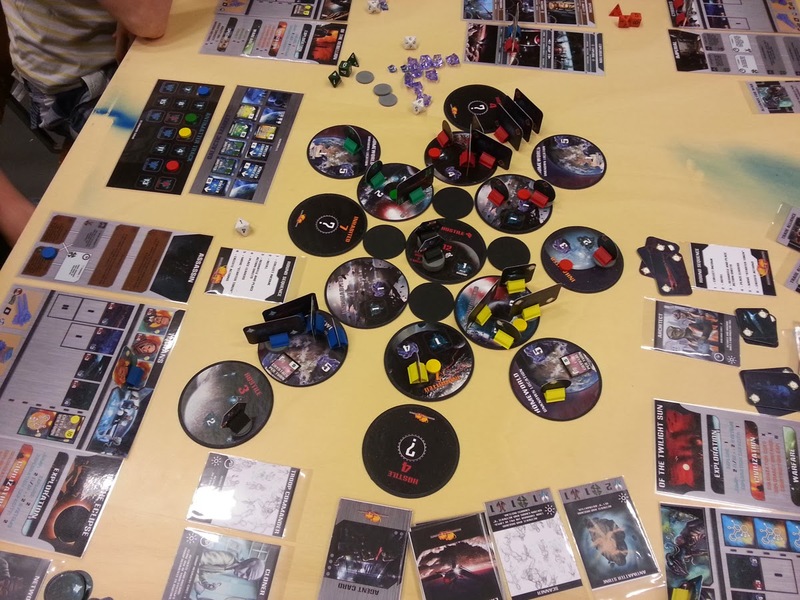 Megacon Games decided not to go to Kickstarter with their space 4X game Emergence Event, which was a surprise to me based on their previous successes. Emergence Event has all the hallmarks of a great 4X game; exploration, technology building and massive capital ships fighting toe to toe. Where Emergence Event stands out is the use of timescales. The game will play over several ages and as these ages advance the difficulty of the game will increase. The rules are available over on the Megacon Games website and this game was due to be out already, hopefully we will see it soon. The only collectible / customisable / expandable / living card game on this list is the only one I know about, the second edition of A Game of Thrones the Card Game. I really like the original version but it’s a very difficult game to get into, hard to learn and even more difficult to master and some of the graphic design is now looking a little dated. I’m really interested to see how Fantasy Flight Games and designer Nate French can streamline the game yet keep its deep strategy. I’m a little bit annoyed that my current collection of cards will become defunct but if a new version means I get to play the game more, then that is a benefit. Just as 2015 will be the year of the hybrid game I’m also predicting it will be the year of the legacy game. Epitomised my Risk Legacy, and where the name comes from, Legacy games are those where each game will permanently affect future games. From changing the board and destroying components, to naming cities and finding new cards hidden in box, Risk Legacy was something unique that its creator Rob Daviau is working hard on replicating this year. The first of these legacy games to be announced was Seafall, an exploration and conquest game where mighty empires have come out of a dark age and discovered the great oceans and seafaring technology. It promises exploration, trading, raiding parties and ship to ship combat, as well as the constantly changing and incredibly personal world that the Legacy system will create. The game was originally intended to be released in 2014 and apart from the initial announcement there hasn’t been any news of the game’s development in some time. Here’s hoping that Seafall lives up to its promises. Whereas Seafall is completely new game, Pandemic Legacy will take the Legacy system to our favourite disease fighting cooperative game Pandemic. If anything Pandemic seems like the natural fit for a constantly changing game, as cities fall to the outbreaks and the viruses themselves change and evolve. Remember way back when I said the X-Com would make a brilliant board game, well it seems that Eric Lang (him again) and Fantasy Flight Games where reading this blog because they are about to release X-Com The Board Game. If this was a standard strategy board game I’d be happy as a pig in mud but there’s an interesting twist as the game requires a smartphone app to play. We’ve already seen the start of technology integration with Alchemist, but X-Com looks like it takes that a step further. Modiphius, a company more famous for its role playing games, are also bringing a double whammy of cooperative games this year, and both look like really interesting concepts. Achtung! 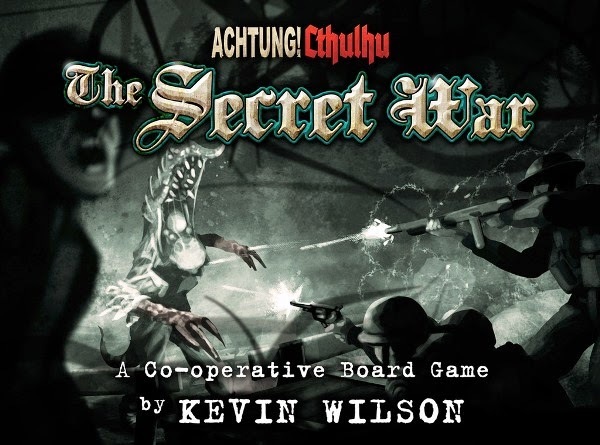 Cthulhu: The Secret War is probably the more conventional of the two. Set within Modiphius’s Achtung! Cthulhu world, the game will see players fighting off Lovecraftian horrors during World War 2. The game is being developed by Kevin Wilson, who also had a hand in Arkham Horror, so at worst this game could end up being a slightly re-themed version of said game, which in all honesty is not a bad thing. It is however, Thunderbirds that holds the most interest. Growing up in the UK it is a legal requirement to have watched the Thunderbirds at some point in your life (even if it was the weird anime version they used to show on Going Live). You must also have tried to make your own Tracy Island out of toilet rolls and sticky back plastic! 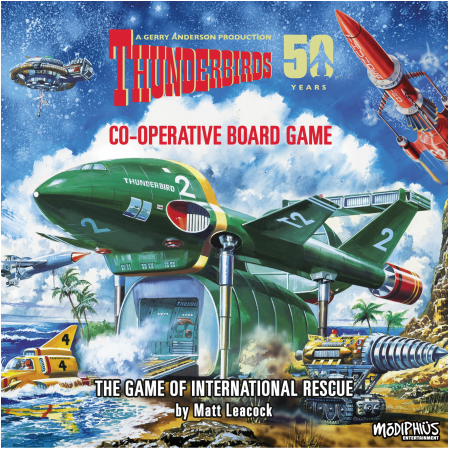 Thunderbirds sounds like the ideal setting for a cooperative board game; a variety of over the top disasters, a team of highly specialised vehicles, a global setting and Thunderbird 2, the game practically designs itself. If I have a concern, it’s that Matt Leacock , the game’s designer is most famous for making Pandemic and its derivatives (e.g. Forbidden Island) and although a reskinned Pandemic could work for Thunderbirds, it’s not going to be thematic enough for the setting. I spoke to Greg Carslaw last year about Wizard’s Academy and it made me really interested in the game. Greg makes some truly unique games and Wizard’s Academy appears to be no exception. As the name suggests you’ll all be students in a college of Wizardry and you’ll have to complete a story based objective. You could be attempting to summon and bind a demon, prevent the school from flooding due to a wonky water spell or defend the academy from the dreaded school inspectors much like a demonic version of Ofsted. On its own this would be enough to keep me fascinated but there’s also an interesting mechanic for using spells, where players have to learn the correct magical combinations via a grid based memory game. Do you know what spices up cooperative games? Hidden traitors and we all know that Battlestar Galactica is one of the best in the genre. Well a few years back Evan Derrick made a streamlined version of the game, called it BSG Express and released it for free as a print and play game. 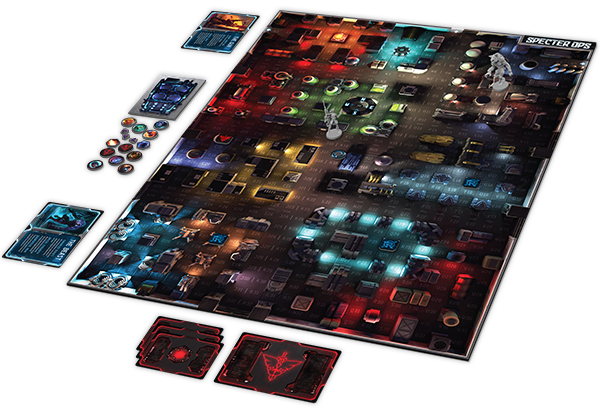 The game proved very popular, so popular that Stronghold Games have rethemed the game and are releasing it as Dark Moon. 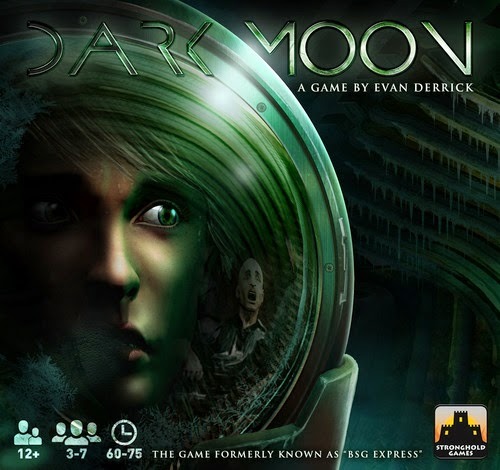 Moving the action to a mining colony on Titan, Dark Moon has players desperately trying to survive by repairing life support and shields while at the same time a mysterious disease is turning players against each other. 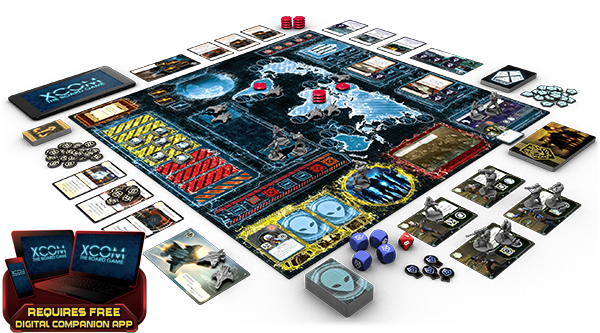 BSG Express has already proven a popular game and the Stronghold Games new version means we’ll get to play it without running out of printer ink. Another semi-cooperative game, but this time without traitors that has caught my eye is Spectre Ops. This should be out very soon, as that very nice man Rodney Smith has already done a play through. One player will take the role of a secret agent infiltrating a building while the rest of the players join forces to find and stop them. Hidden movement games aren’t new, and there’s a little bit of Ninja: Rise of the Scorpion Clan about this game but the cyberpunk setting and one versus many approach means Spectre Ops could be the first must have game of 2015. 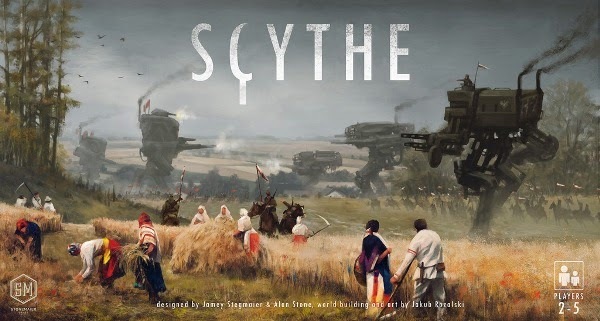 Very last on the list, mainly because I don’t think the game will be out until 2016 is Scythe. Now if I told you that this is a euro style game about farming in the 19th century you might decide to turn away. For all its clever mechanics I’m just not drawn to Agricola. But add some Kemet map conquest element and add some giant mechs and you have my interest. It’s also going to be from Stonemaier Games so expect a lavish Kickstarter and fantastic components.